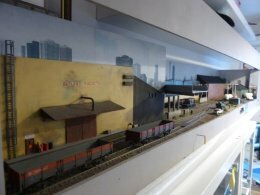 OO Gauge Micro Compact Lightweight Exhibition Standard Model Railway Layout wired for DCC. 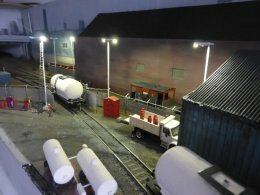 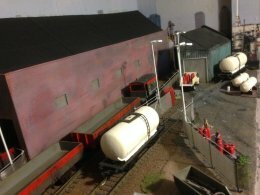 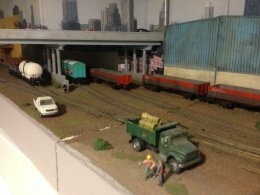 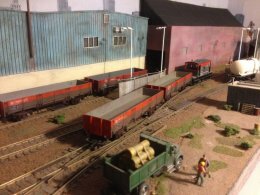 Left Hand Side: Two siding to the front of layout accessing a warehouse, to the rear behind the back-scene is a single track section plate fiddle yard to three tracks / lines including a rear siding which entered into a warehouse on the right (with working floodlights). 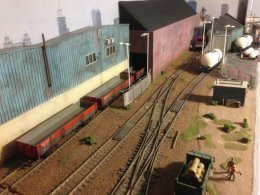 Centre : Road bridge covering (entrance to the fiddle yard), three tracks / lines and a double slips point. 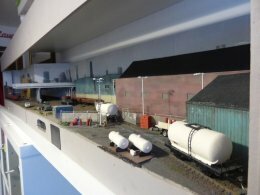 Right Hand Side : A gas cylinder terminal to the front fed by a siding with working floodlights and head shunt along front of the warehouse running to an opening in the scenic board (potential for a larger fiddle yard, head shunt has been cut back a couple of inches ready for connecting). 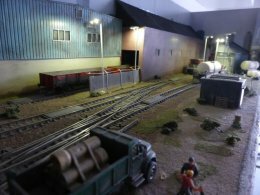 All track and points are Peco, all points are motorised and wired separately with its own power supply (power supply supplied) all to toggle switches at the front of the layout.